Divers off the coast of Norfolk have discovered a submerged prehistoric forest, hidden underwater for 10,000 years. The forest was part of Doggerland – a land area which connected Germany and Great Britain up to 8000 years ago. This is a forgotten part of Europe, hidden under 200 meters of water. Divers discovered it after a winter storm shifted thousands of tonnes of sand beneath the ocean. Research has already been conducted on wood from the forest, and scientists dated it at 10,000 years. Professor Julian Andrews from the University of East Anglia who conducted the study, called the discovery “very exciting”. “I couldn’t believe what I was seeing at first. The sea was quite rough by the shore so I decided to dive slightly further out and after swimming over 300 metres of sand I found a long blackened ridge. When I looked more closely I realised it was wood and when I swam further along I started finding whole tree trunks with branches on top, which looked like they had been felled”, said Dawn Watson, who discovered the forest. 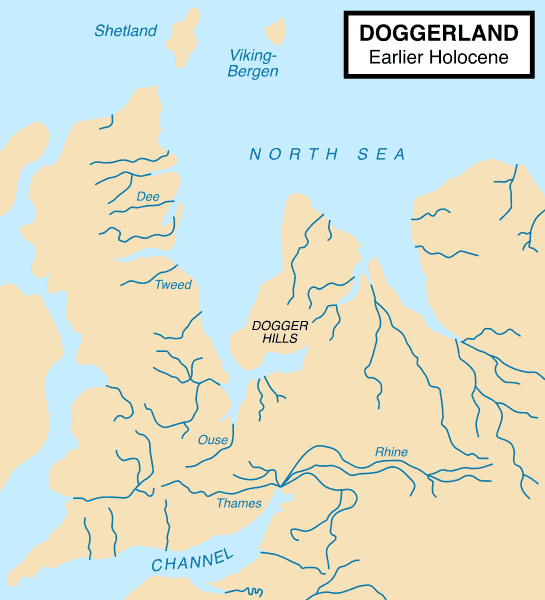 Doggerland was a former landmass in the southern North Sea that connected Great Britain to mainland Europe during and after the last Ice Age until about 6,500 or 6,200 BC. Gradually raising sea levels slowly flooded Doggerland. Archaeologists have exhibited interest in the area for more than a century, but interest intensified in 1931 when a commercial trawler dragged up a barbed antler point that dated to a time when the area was tundra. Since then, archaeologists have unearthed remains of mammoth, lion and other land animals, and small numbers of prehistoric tools and weapons. Geologist Martin Warren said Doggerland was part of a “country Europe forgot”. As the Doggerland tundra became more and more flooded, it eventually turned into a marshland, forcing populations to slowly retreat either towards the west (UK) or the east (continental Europe). But geological studies show that a five meter tsunami likely wiped out remaining populations at one point. Initially, this forest was discovered by Sea Search diver Dawn Watson, who came across “an enormous wave of black stuff. It wasn’t until later that he discovered he had stumbled upon an ancient oak forest. ‘It was amazing to find and to think the trees had been lying there completely undiscovered for thousands of years. You certainly don’t expect to go out for a quick dive and find a forest’, Watson said. She uns the Marine Conservation Society’s survey project, Seasearch in East Anglia with partner Rob Spray.